For nearly 60 years, since the launch of Sputnik on Oct 4, 1957, humans have been a spacefaring race. Our exploration of this final frontier and attempts to make ourselves at home in its unforgiving environs have been punctuated by spectacular successes as well as some of humanity’s most heartbreaking failures. Yet some of the most frustrating experiences in space have been those that fell somewhere in between: satellites that successfully achieved their desired orbit, but then failed to function properly, or whose missions were cut short because of the premature loss of a key instrument. These frustrations are often two-fold—first because ground controllers have an incomplete picture of what exactly has gone wrong, and second because even if they do figure that out, there is typically little that can be done about it. Space is an incomparably valuable domain for so many modern conveniences and the one domain where failure is absolute — where even a small glitch means having to start again from scratch. We produce these exquisitely engineered gems of technology, spend years and millions of dollars perfecting them, but we can’t even examine them closely once they are launched, much less open a tool box and loosen a stuck antenna or top off a fuel tank. Imagine how transformative it would be if we could routinely inspect, repair, and service our growing, invaluable fleet of satellites. In fact, servicing of satellites is not a completely new or unpracticed idea. 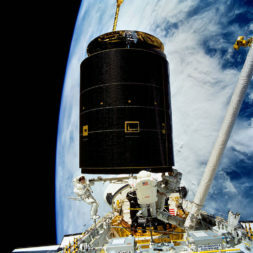 NASA has an impressive history of successes, including its famous fixes and upgrades to the Hubble Space telescope and the capture of Intelsat-6 for re-boost on shuttle mission STS-49. The construction and ongoing maintenance of the International Space Station is a remarkable example of our growing facility as tool users on orbit. And DARPA and NASA have jointly demonstrated robotic refueling technologies in low-Earth orbit (LEO) through their Orbital Express program. 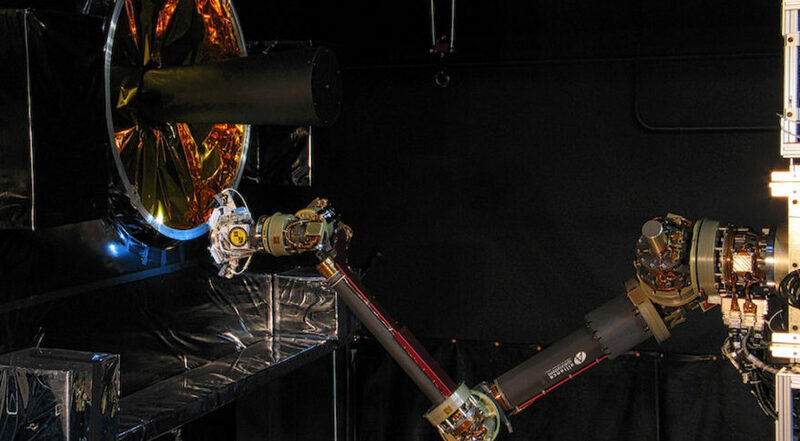 Exciting ventures are on the horizon, including NASA’s Restore-L mission which will demonstrate servicing technologies in LEO, and DARPA’s Robotic Servicing of Geosynchronous Satellites (RSGS) program, which will demonstrate servicing technologies in GEO. These technologies will benefit civil, national security, and commercial satellites alike. Over time, however, these kinds of activities will not — and should not — be limited to government agencies. As we move forward into a future in which commercial entities will be flourishing in Earth orbit, servicing will clearly become a valuable market given the many public, private and security equities. In fact, some commercial companies are also independently assessing and investing in on-orbit servicing. That is why we believe now is the time for government and commercial representatives to start creating a voluntary framework for coordinating commercial servicing activities on orbit. Such an effort would ensure that commercial entities have the benefit of the lessons learned from government operations, and could provide a foundational understanding of shared perspectives on appropriate activities and behaviors in this increasingly crowded and still treacherous environment—an environment where a small mistake by one could harm many others. Toward this end, DARPA and NASA are announcing co-sponsorship of a privately led effort to leverage emerging government-developed best practices to develop non-binding industry consensus standards for safe robotic servicing by commercial servicers. While DARPA and NASA are serving as the impetus for this consortium with DARPA providing initial funding, we envision industry eventually taking full responsibility for this effort as it has done with standards-setting in other domains. To start the process, activities of the consortium will include assembling relevant U.S. government experts to determine the scope of these intended standards and hosting one-on-one meetings with industry representatives to understand their relevant technical approaches while protecting proprietary business plans. With the assistance of the State Department, we also intend to encourage international consultation to solicit additional thoughts on what such standards might encompass and how they might be developed and applied internationally. Finally, all stakeholders from industry and government will be convened to develop and issue voluntary core standards, with the goal of being able to address complex scenarios based on universally agreed-upon safety principles. DARPA has issued a draft Broad Agency Announcement to launch this effort, entitled “Consortium For Execution of Rendezvous and Servicing Operations,” or CONFERS, accessible via www.fbo.gov. DARPA conducted an associated Proposers Day on Dec. 16, and we look forward to participation from across the stakeholder community as we move forward. Pam Melroy is a former astronaut and deputy director of the Tactical Technology Office at the U.S. Defense Advanced Research Projects Agency. Dava Newman is NASA deputy administrator.